Discussion in 'Strippers, Stitch-n-Glue, and Other Wood Composite' started by Michael Duffy, Nov 6, 2018. I'm just finishing a 16 ft Hiawatha (very modified) made with 1/8" thick strips. I found myself dealing with some very unusual problems. The most frustrating was picking a a 12' strip and having it break, I had to turn the strip on edge to reduce the breakage (took awhile to figure that one out). The next issue was the strips wouldn't lay flat as I approached the curve. It looked like I had bent a narrow strip of sheet metal,lots of wrinkles on the inside of the bend. Tried several ways to get it flat with no success. I ended up laying strips along the keel line and working my way down. When a strip started to wrinkle I reduced the bend and added some tapered strips. The biggest problem was sanding the hull fair. A 1/8" strip doesn't have a lot of surface area for gluing and I had to re-glue a lot of pieces. With the forms placed at 12" there was not much support. The hull would flex in as I sanded it. I ended up making some intermediate forms and placed them where needed. This helped a lot but took a lot of time to loft the new forms so they fit. I wish there was a formula that could be applied to determine the intermediate forms offsets. The modifications to the original design included lowering the fore and aft sheer lines to get rid of the sails and widening and flatting the center for better better stability. My son who is an experienced canoeist tipped his canoe several times with a stiff wind contributing. I'm in the middle of varnishing now and am reasonable happy with the results, I'm estimating the weight at just over 30 pound which is what I was looking for. A question for the experts, I was at my local supplier and got into a discussion about where clear cedar could be found. I told the owner that I bought the clearest cedar decking I could find planned it down to 3/4" and then ripped 1/4+ strips. 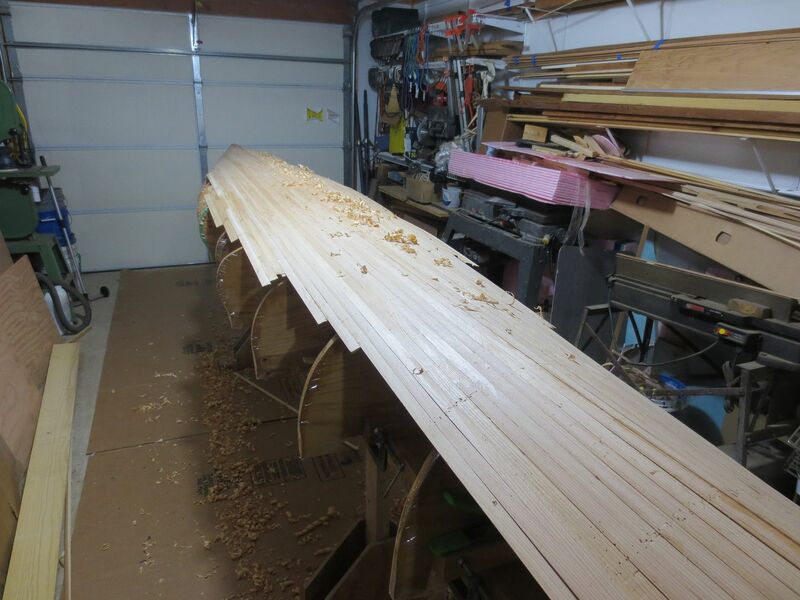 He made a comment that using quarter sawn strips made for a weak hull and I should find another solution. I've built several canoes 20' to 13' this way and aside from careless paddlers have had no problems. Any comments? Bull. The core is a pretty minimal element in the strength of strippers. Hull rigidity and strength are much more a matter of the sandwich created by the reinforced skins and the amount of space the core thickness generates between them. 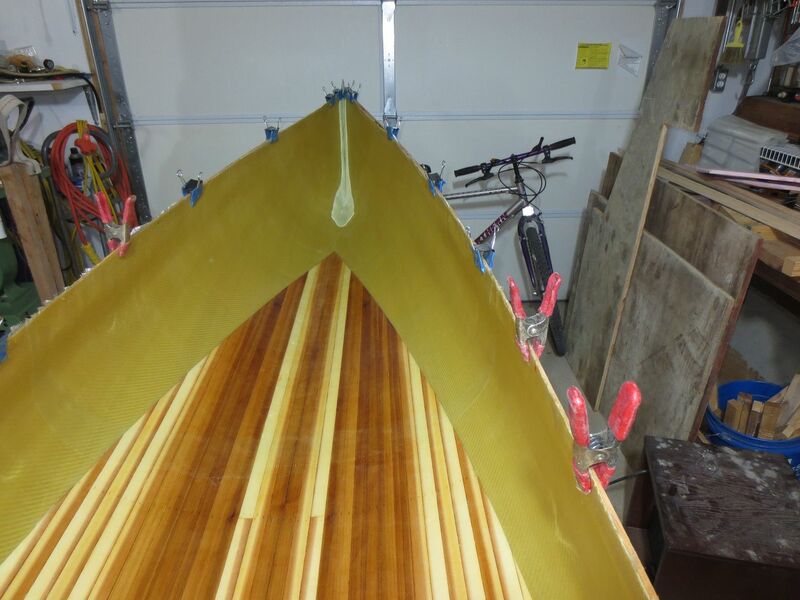 You can build a perfectly usable canoe with a balsa core or a foam core (neither of which will be as sturdy as quarter sawn cedar) as long as the composite lamination schedule is good. If there is a weak spot to your design, I would suspect it to be the thinness of the core strips and their reduced ability to hold the load bearing skins apart and make the most of them. Stripper construction will not tolerate bottom bounce in use for long before it fractures. If you end up getting a lot of it, it's time to glass-in some half-ribs or pogo-stick the bottom. Kent E. Nord likes this. On my last stripper, I used 1/8 strips on the sides, no problem. I started with 3/16 in/on the bottom, went to 7/32 in the curved areas, and then 1/8 on the sides. The glass layup is 4 layers in and out, 2 of 2.85 oz and 2 of 2.3 at 90 degrees. The hull w/o trim is 40 lbs, this for a 18.5 deep tripper. The glass strength of this layup is several times stronger than a "standard" 6 oz layup. For further reading of this, do a search for George Roberts. He pushed strip building more than anyone else I'd heard of. At the time, his best layup was 2 (or 3?) layers of 3.2 oz and 1/8 strips. I'm pretty sure George was using three layers on his kayaks. I don't know whether he still builds boats or not. As far as I know he was eventually banned from the WoodenBoat forum due to some pretty serious and nasty legal and moral situations he got himself into and it got to the point where most forumites wouldn't even speak to him. Yup, that's what I remember also. Forgot to mention I installed full ribs at 12" and filled in between with 3 half ribs. Neither I nor my dog like hulls that flex. Interesting ! I just finished stripping an insert for the bottom of a Carbon fiber/Kevlar composite build ! 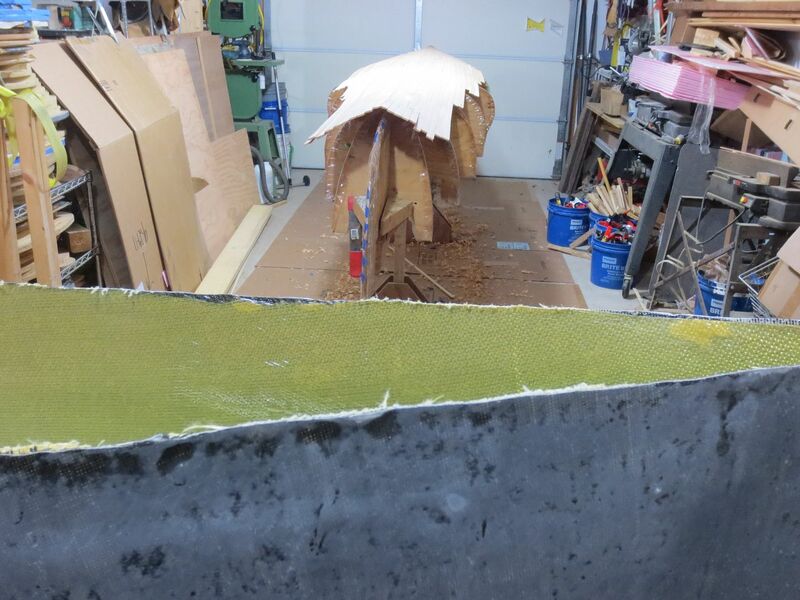 Started stripping the insert (1/8") thick, from the keel out, to just into the curve of the bilge. Just edge glued the strips, no beveling. It worked great. Yes, you have to watch strip alignment! A great abundance of spring clamps helped a lot. All my strips were cut from #3 grade 1x WRC. Slash cut (Flat grain) planks. So that made my strips Quarter sawn. This made them stiffer, and easier to work ! Grain matters !!! Strips, if they are Quarter sawn, will add stiffness, and some strength. If they didn't, two layers of 6 oz E-glass would be all you need ! Thicker strips will add stiffness, and a smaller amount of strength, not to mention weight. 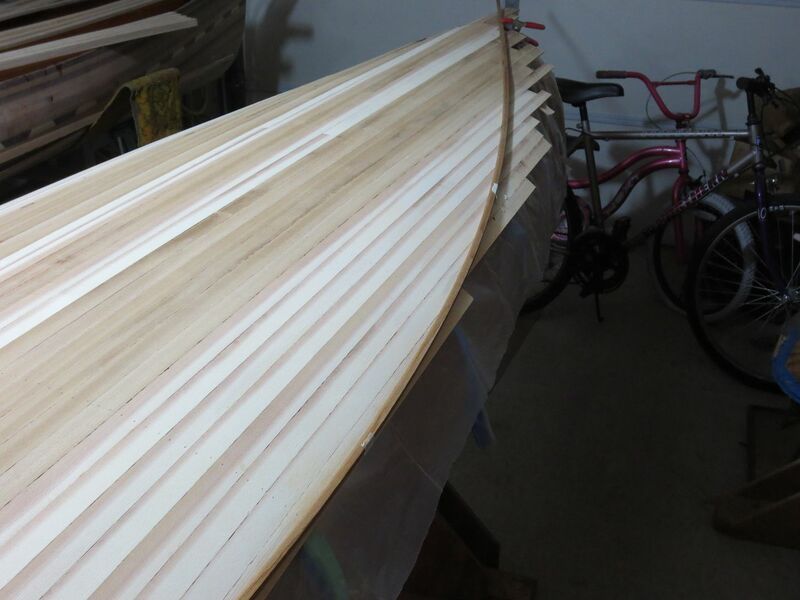 I have contemplated building a complete hull with 1/8" strips, just really don't see the real advantage. Again, do a search on George Roberts, maybe some of his doctrine is still out there. I faintly remember George's posts. He had little to offer but Banter. Maybe someone with actual knowledge would like to climb on board ! Thanks at least for taking me back in time a little, as I Skimmed George's posts. At one time, GR had some analysis on his site that compared a number of different glass/wood schedules, in an effort to find the best combination of strength, toughness and weight. 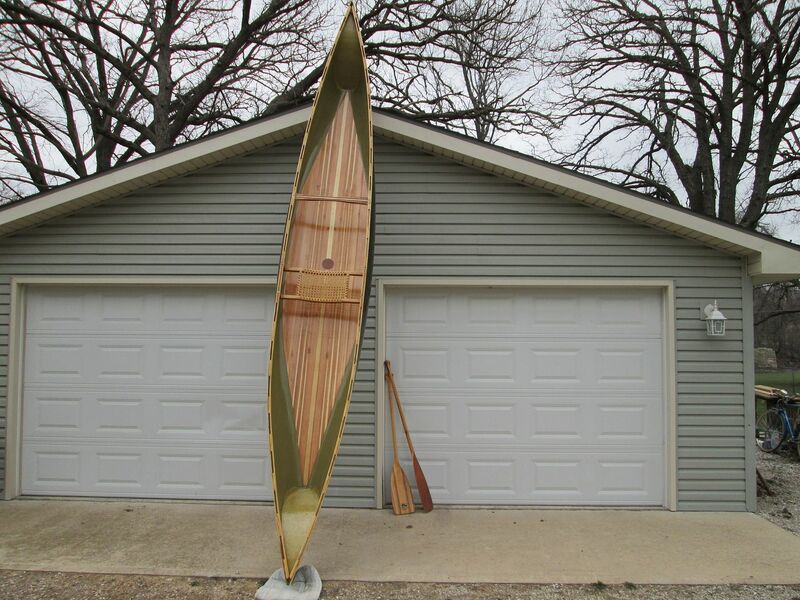 He built very light kayaks that he didn't baby. IIRC his best schedule (at the time), and what he built with, was 1/8 strips with 3 layers of 3.2 glass (unknown weave pattern) each side. smaller glass fibers tend to be stronger then larger fibers. All of this is now convoluted with the addition of kevlar and spectra (and maybe others) to the mix. Oh, the advantage to thinner strips is lighter weight and possibly a stronger hull (assuming the wood weight is replaced with glass weight). 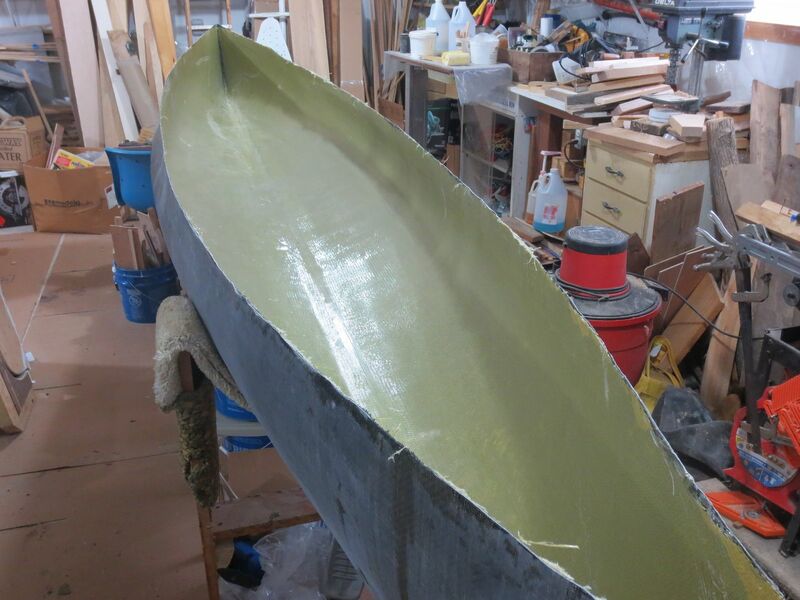 Making a light canoe is easy, making a heavy canoe is easy, making a light strong canoe is very difficult. I'm sure of one thing. the bond I get between the cloth and WRC insert is far better than Pink construction foam insert I used on my first composite build!!! This is my 3rd, with the cedar insert. A few pics of my inserts. Whoops ! My current insert. What's the last pic of? Are you trying all cloth/resin? That is the hull, that will receive the insert. I used my recent stripper (Pearl) as the male plug, for this hull. I am thinking there is an all glass hull, in my future ! That's interesting, can you make a separate string for it? and post plenty of pics. and sure how many, 7-8?, and not sure his process. Yes, Moran was my inspiration for these ! here is a few links to my threads, over at canoetripping .net. There are several others on that site that have done the same thing, if you look around, you should be able to find them ! By the way http://www.canoetripping.net/forums/images/logo2.gif is a great site !